Show and Tell Meg: Another Craftsy Class - I'm Learning Tailoring! 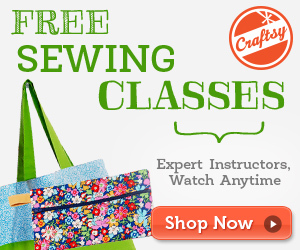 Another Craftsy Class - I'm Learning Tailoring! Well, I just picked up a new Craftsy class that I'm really excited about :) They sent me a discount code so I used it to snag Tailoring Ready-to-Wear - a class teaching basic tailoring techniques. The class will cover hemming and lengthening pants and such, adjusting the sweep of a top, taking in sleeves, and even replacing an invisible zipper. I've watched the first 3 lessons and already learned a ton! The nice thing is that the teacher shows how real tailors do these things .In fact, she says in the class that you could take these techniques and start a minor alterations business. How cool is that?! I'm really excited to get more into this class - I can't wait to alter some of my thrift store finds that maybe aren't quite what I would love them to be :) I'll be sure to post any projects I alter! Go here to learn more about this class and look around on Craftsy.